Brian Cashman (left) and Hal Steinbrenner (right) are the current general manager and chairman of the New York Yankees, respectively. The New York Yankees are a Major League Baseball (MLB) franchise based in The Bronx, New York City, New York. They play in the American League East division. This list consists of the owners, general managers (GMs) and other executives of the Yankees. The GM controls player transactions, hires the manager and coaching staff, and negotiates with players and agents regarding contracts. The longest-tenured general manager in team history is Ed Barrow, who served in that role for 23 years. He was inducted in the Baseball Hall of Fame in 1953. The longest-tenured owner in team history is George Steinbrenner, who was the team's principal owner from 1973 until his death in 2010. During the 1901 and 1902 seasons, the franchise played in Baltimore as the "Baltimore Orioles". They became defunct, but were purchased by William Stephen Devery and Frank J. Farrell for $18,000 and moved to New York in 1903. Jacob Ruppert and Tillinghast L'Hommedieu Huston purchased the Yankees in 1915, and Ruppert bought out Huston in 1922. Dan Topping, Larry MacPhail, and Del Webb purchased the Yankees from Ruppert's estate in 1945. Topping and Webb forced MacPhail out of the Yankees ownership group due to his confrontational behavior after the 1947 World Series. In 1964, Topping and Webb sold the team to CBS, during which time the franchise struggled. Selling the team at a loss, CBS sold the team to a group headed by George Steinbrenner in 1973. While Steinbrenner initially owned less than half of the team, he bought out many of his partners, eventually owning 70% of the team. John McMullen, one of Steinbrenner's limited partners, said, "There is nothing in life quite so limited as being a limited partner of George Steinbrenner." Under Steinbrenner's ownership, YankeeNets was formed after a merger of the business operations of the Yankees and New Jersey Nets. After the Nets were sold to Bruce Ratner, YankeeNets became a limited liability company (LLC) known as Yankee Global Enterprises. The LLC owns the Yankees and the YES Network. 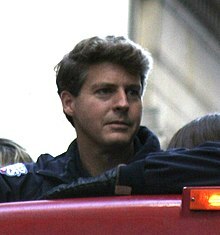 Hal Steinbrenner succeeded his father as control person of the Yankees in 2008. Gabe Paul was general manager of the Yankees during the 1977 World Series. Lou Piniella served as field manager and general manager in 1988. Four Yankees GMs are enshrined in the National Baseball Hall of Fame: Ed Barrow, George Weiss, Larry MacPhail, and his son, Lee MacPhail. Ralph Houk, Gene Michael, Lou Piniella, and Bob Watson were former Yankees players. Houk, Michael and Piniella served as field managers for the Yankees before becoming GM. ^ Schwarz, Alan (December 21, 2005). "2005 General Manager Roundtable". Baseball America. Retrieved June 28, 2009. ^ a b Levitt, Daniel R. (2008). Ed Barrow: The Bulldog Who Built the Yankees' First Dynasty. University of Nebraska Press. ISBN 0803217390. Retrieved March 27, 2012. ^ a b c "Yankees Timeline". Major League Baseball. Retrieved June 18, 2007. January 9, 1903: Frank Farrell and Bill Devery purchase the defunct Baltimore franchise of the American League for $18,000 and then move the team to Manhattan. ^ "Ruppert and Huston Get Yankees' Stock; Final Details Consummated in Transfer of Club -- Johnson Scores Feds". The New York Times. January 31, 1915. Retrieved April 11, 2012. ^ "Ruppert to be Sole Owner of Yankees; Deal for Huston's Half Interest in Ball Club Will Be Closed This Week. Price About $1,500,000. Transaction Will Give Buyer Control of the Richest Holding in Baseball. Property Worth $5,000,000. Ruppert Denies That There Was Any Disagreement Which Caused the Partnership to Be Dissolved". The New York Times. December 12, 1922. Retrieved April 11, 2012. ^ a b c "Larry Says Goodbye". Time Magazine. October 20, 1947. Retrieved August 28, 2009. ^ a b Murray Chass (January 19, 2005). "On Baseball; Steinbrenner Reaches Top Of Owners' Seniority List". The New York Times. Retrieved August 31, 2009. ^ a b c Sandomir, Richard (July 15, 2010). "Praise for Steinbrenner From Limited Partners". The New York Times. Retrieved April 2, 2012. ^ Toobin, Jeffrey (May 30, 2011). "Madoff's Curveball". The New Yorker. Retrieved May 23, 2011. ^ Richard Sandomir (February 26, 1999). "They're the YankeeNets: A Marriage Made for the Tube". The New York Times. Retrieved August 28, 2009. ^ "Yanks, Nets, Devils separate from company". ESPN. Associated Press. March 23, 2004. Retrieved August 28, 2009. ^ "Statement from Howard J. Rubenstein, Spokesman for the New York Yankees" (Press release). Major League Baseball. November 20, 2008. Retrieved November 11, 2009. ^ "Yankees Timeline". Major League Baseball. Retrieved June 18, 2007. January 3, 1901: John McGraw was both manager and owner of the new American League franchise, the Baltimore Orioles. Two years later, the franchise was purchased by Frank Farrell and Bill Devery, and they moved it to New York City and became the Highlanders. ^ a b "Ruppert and Huston Buy the Yankees; Farrell Sells New York Baseball Club for $500,000 -- Donovan Manager". The New York Times. January 1, 1915. Retrieved August 28, 2009. ^ "Yankees Timeline". Major League Baseball. Retrieved June 18, 2007. May 21, 1922: Col. Ruppert buys out Col. Huston for $1.5 million. ^ "No Yankee Deal Now in Making". The Evening Independent. March 15, 1940. Retrieved August 28, 2009. ^ a b c "New York Yankees Sold to Syndicate". Ellensburg Daily Record. Associated Press. January 26, 1945. Retrieved August 28, 2009. ^ "Baseball (Yankees) Married to TV". Toledo Blade. August 13, 1964. Retrieved August 29, 2009. ^ a b "Yankees ownership shifts to Steinbrenner's son Hal". USA Today. Associated Press. November 22, 2008. Retrieved August 28, 2009. ^ "Baseball Pioneer Weiss Dies At 78". St. Petersburg Times. August 14, 1972. Retrieved April 4, 2012. ^ "Fame Beckons Joss, MacPhail". The Milwaukee Sentinel. United Press International. January 31, 1978. Archived from the original on July 13, 2012. Retrieved April 4, 2012. ^ "Ralph Houk Statistics and History". Baseball-Reference.com. Sports Reference LLC. Retrieved April 4, 2012. ^ "Gene Michael Statistics and History". Baseball-Reference.com. Sports Reference LLC. Retrieved April 4, 2012. ^ "Lou Piniella Statistics and History". Baseball-Reference.com. Sports Reference LLC. Retrieved April 4, 2012. ^ "Bob Watson Statistics and History". Baseball-Reference.com. Sports Reference LLC. Retrieved April 4, 2012. ^ "Gene Michael Managerial Record". Baseball-Reference.com. Sports Reference LLC. Retrieved April 4, 2012. ^ "Lou Piniella Managerial Record". Baseball-Reference.com. Sports Reference LLC. Retrieved April 4, 2012. ^ a b "Berra Said Yank Pilot". St. Petersburg Times. Associated Press. October 23, 1963. Retrieved April 1, 2012. ^ "McHale Named Baseball Czar's Right Hand Man". The Morning Record. Associated Press. January 12, 1967. Retrieved April 1, 2012. ^ a b "MacPhail Gets Job on Tuesday". Bangor Daily News. United Press International. October 22, 1973. Retrieved April 1, 2012. ^ a b "Paul to Leave Yankees for Head Indians Post". The Morning Record and Journal. United Press International. December 2, 1977. Retrieved April 1, 2012. ^ Nelson, John (November 22, 1980). "Michael Ready to Assume Risky Yankee Job". Kentucky New Era. Associated Press. Retrieved April 1, 2012. ^ a b "Michael Is Named Yanks' General Manager". The New York Times. August 21, 1990. Retrieved April 1, 2012. ^ a b "Baseball; Yanks Spirit Watson Away From Astros for G.M." The New York Times. October 24, 1995. Retrieved April 1, 2012. ^ "Reds Hire Yank Executive as New General Manager". Gainesville Sun. Associated Press. October 20, 1984. p. 3B. Retrieved April 1, 2012. ^ "Sports People: Cook Gets Expos Post". The New York Times. September 6, 1984. Retrieved April 1, 2012. ^ "Yankees Shuffle Exec Staff". Record-Journal. United Press International. April 10, 1984. p. 11. Retrieved April 1, 2012. ^ a b Illuzzi, Joe (October 11, 1986). "Almost-fired Piniella Signed to 2-year Contract". The Deseret News. p. 2D. Retrieved April 1, 2012. ^ a b "Quinn to Get Yankee Job". The New York Times. June 8, 1988. Retrieved April 1, 2012. ^ "Baseball; Quinn in Line for Giants Job". The New York Times. December 1, 1992. Retrieved April 1, 2012. ^ Parascenzo, Marino. "Yanks' Name Peterson as GM". Pittsburgh Post-Gazette. p. 22. Retrieved April 1, 2012. ^ a b Botte, Peter (February 3, 1998). "Cashman's On The Fast Track". New York Daily News. Retrieved March 27, 2012. ^ "Yanks have new president". The Cincinnati Post. January 6, 2000. p. 2C. ^ "Scoutmaster in the Bronx: Oppenheimer finds young talent". New York Daily News. February 24, 2008. Retrieved April 4, 2012. ^ Curry, Jack (March 14, 1993). "Baseball; He Was 44. Now He's 46. Reggie Is Back". The New York Times. Retrieved April 2, 2012. ^ Jim Baumbach (March 23, 2008). "On second thought, Tino digs coaching". Times Record-Online. Retrieved August 28, 2009. ^ "Alex Rodriguez rejoins the Yankees as a special advisor to the GM". www.cbssports.com. Retrieved February 25, 2018. ^ "Hideki Matsui joins Yank's Front office". www.espn.com. Retrieved March 11, 2015. ^ "Stump Merrill named special assistant to the General Manager". MLB.com. March 10, 2005. Retrieved August 28, 2009. "Front Office". Major League Baseball. Retrieved April 4, 2012. This page was last edited on 13 February 2019, at 21:18 (UTC).